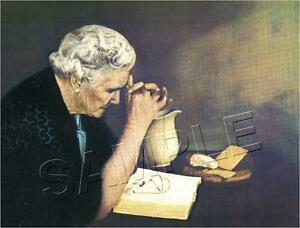 Edition Type: Open Edition Size Type/ Largest Dimension: 11" x 8.5"
It is the passage from the Book of Matthew known as the 'Our Father', and is depicted perfectly by the old woman bowing to the Father in prayer. printed on genuine canvas with the texture of the canvas bringing out even more of the richness and beauty of this classic work of art. Promised and delivered. Very high quality. Resembles a true canvas.